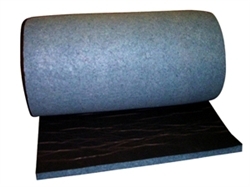 UltraLiner Sound Blanket, 1" x 4' x 50', is made from post-consumer recycled denim that is thermally bonded to create a high-performance thermal insulator and acoustic blanket. UltraLiner offers both superior sound absorption and energy saving thermal performance. One side of the UltraLiner is lined with a durable, fire-resistant, acoustically transparent, black facing that provides additional strength to the product.